A decimal separator misplaced in the 1870s caused the false reputation of spinach for being the vegetable that was richest in iron. Though still highly popular, this narrative is wrong (see here and here). The new narrative can be stated most simply as follows. The decimal error is a myth, it never occurred. The false reputation of spinach was due to unreliable methods or poor experimentation. That is, errors were inherent in experimental methods, not data handling or a typo (see here). Moreover, Arnold E. Bender and Terence Hamblin were, according to this judgmental new narrative, promulgating pure and utter nonsense based on no true decimal error whatsoever, when they popularized the old narrative. This new narrative is combined with stuff about Popeye and peddled as a hero story about busting a myth about a myth (or "supermyth"). It seems to be highly popular for this reason, but it is also wrong, because a real decimal error did occur and it can explain why the eminent researchers, Arnold E. Bender and Terence J. Hamblin, mixed things up and, inadvertently, created the spinach-iron-decimal-error myth.The important difference between the new narrative and the one to follow is that the latter can explain Bender's and Hamblin's blunder, where the above only returns a verdict verging on insult. Throughout this series of reconstructing the data handling of the primary research literature, I found that the relevant research was full of data handling and data transformation errors, but none of these errors was as simple as misplacing a decimal separator (see here). Neither Mike Sutton's original sleuthing, nor my in depth analysis and reconstructions of the historic data handling and transformations ever found a displaced decimal separator that could explain why an eminent researcher such as Arnold E. Bender should have come up with that myth. Surprisingly, I now found a real decimal error that can, indeed, explain how Bender's memory fused it with other peculiarities in the research record and, inadvertently, caused the myth in the 1970s. A simple decimal-point error did occur in an article published in—wait for it—Science 90, no. 2347, pp. 596-597 (1939). But the research reported there was about the iron content of dried peas and beans instead of spinach. * So how can it be the mythical error recurring in the urban legend about spinach & iron? 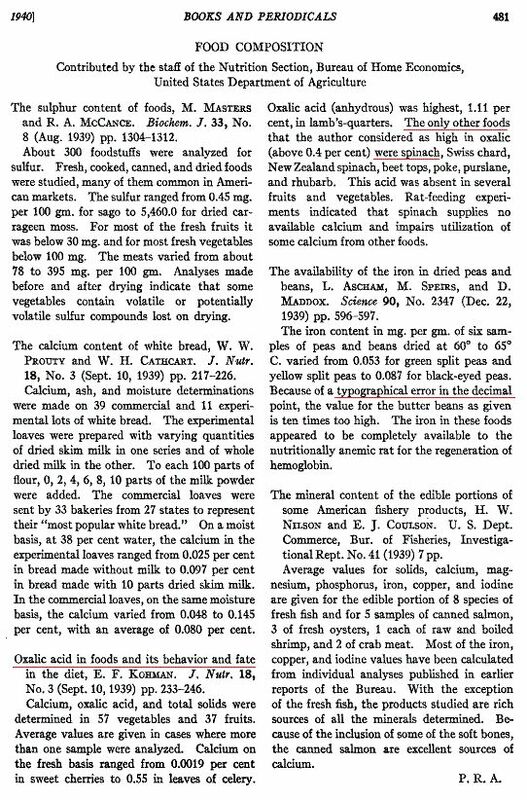 * The full reference is: Aschman, Leah, Mary Speirs & Dorothy Maddox (1939) The availability of iron in dried peas and beans. Science 90, 596-597. As you can see, however, this correction of a decimal point error concerning the iron content of butter beans follows directly on an abstract concerning the contents of oxalic acid in vegetables including spinach. Now, one big topic in the debate about the usefulness or uselessness of spinach as a dietary source of iron was oxalic acid, because it binds the iron and thus inhibits the absorption of it by the consumer. In his inaugural lecture, Arnold E. Bender (1972, The wider Knowledge of Nutrition, Queen Elisabeth College) attributes the discovery of the decimal error explanation for the exaggerated iron content of spinach to the work of a professor Schupan (see here for an account of the sleuthing up of this first claim that a decimal error occurred in relation to the iron-content of spinach). A lot of this passage is enigmatic or wrong. First, that Professor den Hartog never seems to have published anything himself on the issue. 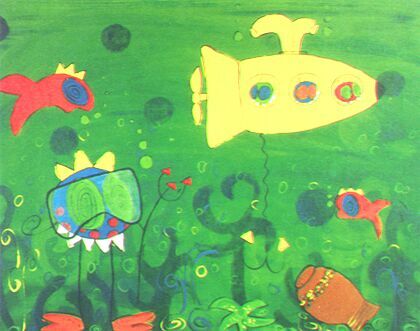 Some C. den Hartog (1971. Nutrition of infants and children. Royal Society of Health Journal 91(3): 111-114) from the Agricultural University in Wageningen, The Netherlands, however, was much into the issue of nutrition, iron deficiency and all that writing: "Neither breast milk nor cow's milk can obviate the need, early in life, for supplements to meet vitamin C, vitamin D and iron requirements" (den Hartog 1971, p. 111, see also p. 114). He has probably been the correspondent of Bender. Second, Dr. Emil Wolff had no title of nobility, when he published his research in 1871 or 1880; the "Von" in "Von Dr. Emil Wolff" on the title-page must be translated as: "By Dr. Emil Wolff." The fact that Emil Wolff did get knighted towards the end of his life does not change his publishing as a regular guy (same with Justus Liebig, Johann Wolfgang Goethe and many other Germans who are often falsely cited as if knighted). Third, Wolff's publications contained no misplaced decimal point relating to spinach and iron content (see here and here). In fact, spinach does not even feature as exceptionally rich in iron content in his publications (lettuce and asparagus should have become famous instead of spinach, if it was up to Wolff's data). The one thing that could be called a decimal error occurred in Wolff's later Aschen-Analysen of 1880 and concerned all chemical compounds in all analyzed vegetables (see here). That is, in transferring data from his 1871 Aschen-Analysen, a heading of a whole table said "in 100 parts" instead of "in 1000 parts." Fourth, the guy studying the iron content of vegetables with the α-α'-dipyridyl method was W.C. Sherman not Schupan. Fifth, the discrepancy of the findings of Sherman and colleagues was indeed down to the difference in methods and not to misplaced decimal point (see here). Later, Bender (1977) released the decimal-point-error legend upon a wider public through a letter to The Spectator. "Sir: In a recent article (18 June) spinach is given undeserved nutritional eminence, although, since the facts have never been widely publicised, the author can be excused. For a hundred years or more spinach has been (and clearly still is) renowned for its high content of iron compared with that of other vegetables, but to the joy of those who dislike the stuff this is quite untrue. In 1870 Dr E. von Wolff published the analyses of a number of foods, including spinach which was shown to be exceptionally rich in iron. The figures were repeated in succeeding generations of textbooks—after all one does not always verify the findings of others including the 'Handbook of Food Sciences' (Handbuch der Ernährungslehre) by von Noorden and Saloman in 1920. In 1937 Professor Schupan eventually repeated the analysis of spinach and found that it contained no more iron than did any other leafy vegetable, only one-tenth of the amount previously reported. The fame of spinach appears to have been based on a misplaced decimal point." Looking, again, at the above image of the Journal of Home Economics (1940, vol. 32, no. 7, p. 481), we can reconstruct Bender's or den Hartog's faulty and mixed up memory as follows (as den Hartog remains an elusive figure in this legend, I will treat Bender's and Hartog's memory as one). He probably remembered the occurrence of a real decimal error concerning the iron-content of some vegetable, but did not remember correctly that it was made by Ashman et al. (1939. Science 90, 596-597) in relation to butter beans. 2. Why the year 1937? As the above quote reiterates the idea that spinach is richer in iron than other vegetables, it is unlikely that he had some years before claimed the opposite. One article published by Schuphan in 1937 (Untersuchungen über wichtige Qualitätsfehler des Knollenseleries bei gleichzeitiger Berücksichtigung der Veränderung wertgebender Stoffgruppen durch die Düngung. Bodenkunde und Pflanzenernährung 2, issue 5-6, pp. 255-304) dealt with quality issues in celeriac including the so-called Eisenfleckigkeit (iron blotchiness) of tubers. He therein debunked the belief that celery tubers turn brown at the cut surface, because of the oxidation of iron and claimed that the colouring is due to resins and essential oils instead. That is, he debunked the idea that the oxidation of iron at the air is the cause of the celeriac getting brown, where it is cut. The last question remaining is: Why did Bender think (misremember) that the decimal error occurred in the 1870s? Why place the decimal error in the 1870s? As a matter of fact, Dahlen's publication consisted of two parts, part A being published at pp. 320-336 of the journal, Landwirtschaftliche Jahrbücher 3, and part B at pp. 723-751. In neither of the parts does Dahlen drop a single word on iron content. He only measured the contents of water, ash, nitrogen, fat, sugar, starch, raw fiber, sulfur, phosphor, ammonia. Hence, there is at least an erroneous citation by Schuphan (1937) to Dahlen (1874), as well as a typo by Dahlen involving a decimal order of magnitude. ** Another article from Schuphan in 1937 (Der gegenwärtige Qualitätsbegriff bei Gemüsen und die Notwendigkeit seiner Erweiterung auf chemisch erfaßbare Wertmerkmale. Der Forschungsdienst 3: 290-303) discussed the general discrepancy between criteria for the marketability of vegetables (e.g., size, form, colour, solidity) and nutrient quality (e.g., contents in essential oils, proteins, sugar, vitamin c). Most of his examples are taken from his own and others' research on celery. He mentions aside, the effect of P-manure on contents of vitamin c, phosphoric acid and lezithin in spinach, but iron is no issue at all. This is probably the explanation for Bender's/Hartog's faulty memory and his inadvertent causing of a mythical debunking of a decimal error that did occur, but not in the 1870s, not in relation to spinach and not by Werner Schuphan. Arnold Bender fused the real decimal error concerning iron centent in butter beans with the oxalic acid content and hence low availability of iron in spinach; he further fused the debunking of an allegedly high iron content in celeriac as the cause of brown blotches at its cutting edges with a faulty citation by Schuphan of Dahlen (1874) and Dahlen's typo of a decimal order of magnitude with all this. And he thus came up with a false story about a decimal separator concerning the iron content of spinach having been displaced in the 1870s, and this having been debunked by Schuphan in 1937. While this is the profane solution to a myth about a myth about the iron content of spinach, everybody is now fascinated about the further myth peddled by Mike Sutton, that no decimal error ever occurred, that no researcher ever existed that would fit to Bender's wrongly spelled "Schupan," and that Bender's memory is anyway pure fantasy and has no roots in anything that really ever happened.